As we finished the Iguazu park, we were ready to leave Argentina once again (this was the fourth time we were exiting its territory) but this time for good. Even though bad weather prevented us from riding on the famous Ruta 40 and from visiting the Perito Moreno iceberg, we have many nice memories from Argentina: about its nature, its cities but especially about the people, probably the nicest ones that we met in our journey. One thing that I didn’t know about this country is the huge variety of products that are manufactured there. Most stores sell domestic merchandise. It doesn’t matter if you want to buy a car, food, medicine or clothing. If you’re shopping in Argentina there is high chance that item will have the “Industria Argentina” label affixed. Another unexpected thing about Argentina (at least for the moment) is the appearance of the President. I remember that, at the time we entered the country for the fist time, Laura asked me who might be that good looking woman whose picture was on display in the customs office. 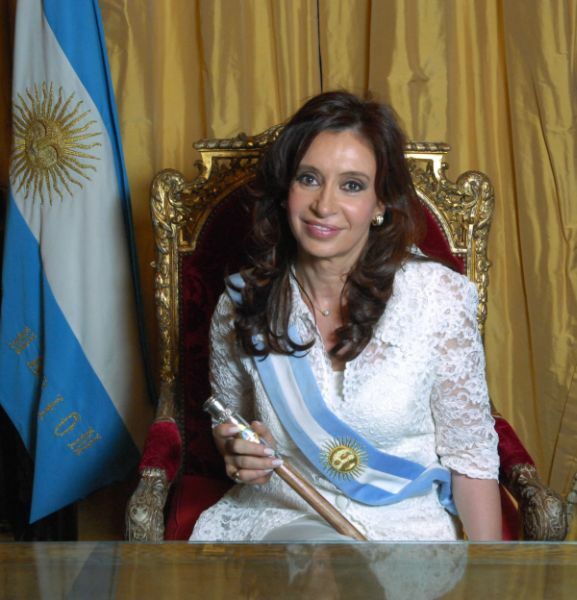 We asked the staff and, to our surprise, we learned that she was President Cristina Fernandez de Kirchner! The Iguazu falls was our last Argentinian objective. The waterfall itself is big, and the park surrounding it is even bigger. Therefore, there is a narrow gauge train that connects the parking lot with the remote areas. From the stations, there are hiking paths through the jungle and, as you get closer, elevated walkways that bring tourists right on top of the waterfall, assuring breathtaking views. The Argentinian side brings people closer and takes around 4 hours to complete (including walking some 3-4km) while the Brazilian side offers wider views. There are some boat tours as well, but considering that we’ve been on many watercrafts lately, we decided to skip. We met Mike, from Germany, in a gas station in Northern Argentina. He had been traveling on his old Africa Twin for one year, and he was close to the end of his journey. We rode together for about 100km until we part ways: he crossed the border in Brazil while we continued North towards Iguazu. We were in a village searching for a hotel. It was around 8:30PM when we entered a muddy street because I thought there was a hotel sign at the end of that street. But by the time we managed to get out of that place it was already 1AM, after enduring the biggest mudding of this trip! Exactly the next day, right after washing the bike, we were once again riding when Laura told me she has seen a wrecked railway carriage on the side of the road. I decided to stop and get off the pavement in order to observe better, and that’s when all the fun began… Once again, we had to remove the side cases, push and so on. But only for one hour this time! Many people in Argentina are somehow involved in motorsport. We’ve seen many racing cars or bikes being transported on trailers everywhere, tuning shops in each town, and during night time, street racing is common. On TV, there are always news about Formula 1, MotoGP, WRC and other rallies. 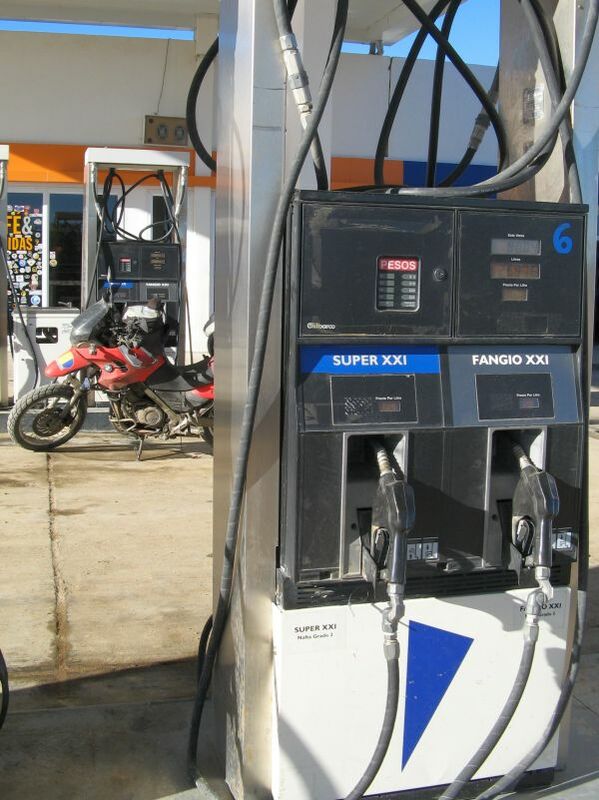 There’s no wonder the name of high grade gasoline is Fangio XXI!